As the UK's national meteorological service, the Met Office has great name recognition and a reputation for accurate and reliable weather forecasts. Even with the plethora of existing weather apps, the arrival of an official Windows Phone 8 app from the Met Office is therefore something that's bound to gain the attention of UK weather watchers. In this review, we take a closer look to see if this is an app that's truly suited to the weather obsessed Brit. 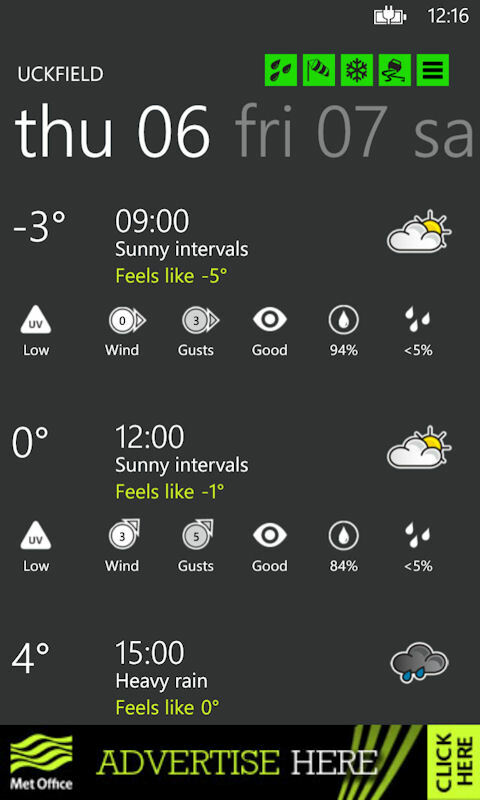 The Met Office app opens to show a pivot view with summary, locations and warnings pages. The app opens quickly, but the weather data, which is loaded over the Internet, takes a few more seconds to arrive, which means, from a cold start, it can take up to five or six seconds before the app is fully loaded. The summary page, by default, shows weather information for your current location, but, via the app's settings, can also be set to show weather information for a specified location. The top half of the summary page shows today's predicted weather conditions (overall forecast, maximum temperature, "feels like" temperature, UV conditions, wind speed, precipitation probability, sunrise, and sunset), while the bottom half shows predicted weather conditions for the next four days. The locations page gives access to weather maps, described in more detail below, as well as weather information for a user configurable list of locations. For each location, a forecast and weather information is displayed for the current day, similar to the top half of the app's opening summary page. The available locations are based on the Met Office's official weather stations, and, in most cases, the nearest location will be no more than a few miles away. Unlike a lot of the data used by other weather apps, the Met Office app really is providing very accurate localised weather forecasts. As a general rule, this means the Met Office app will provide more accurate weather predictions. 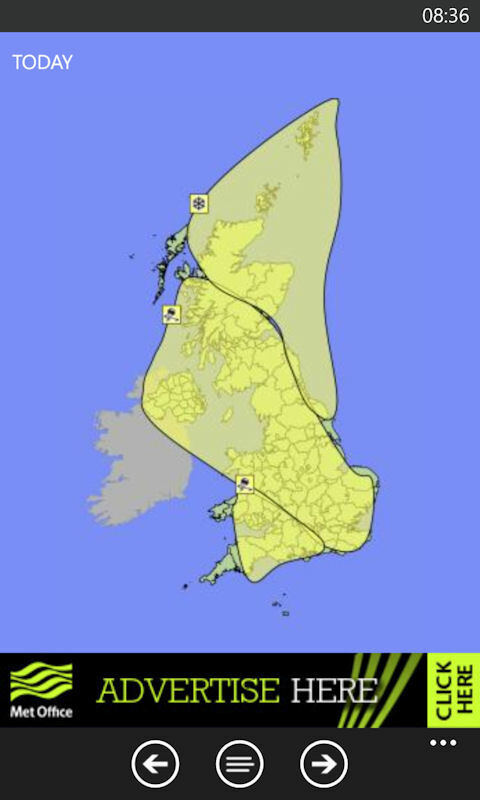 The warnings page gives access to the severe weather warnings provided by the Met Office. These alerts are issued to raise awareness of dangerous weather conditions, and help individuals and businesses plan ahead. 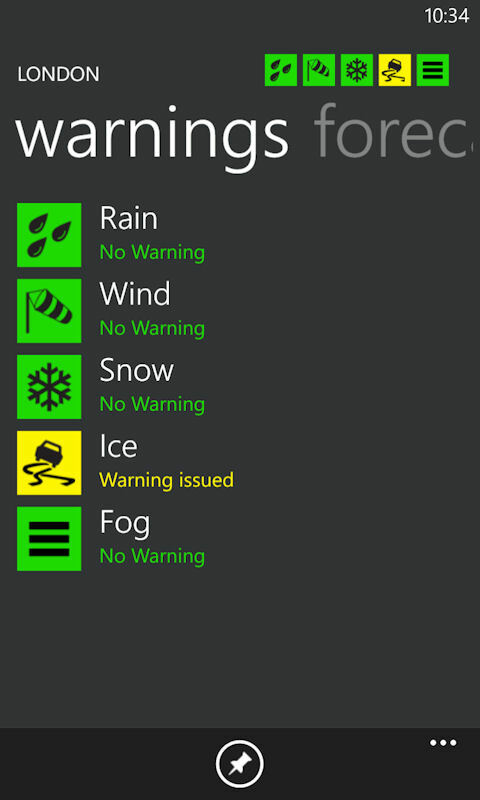 The warnings are divided into different categories, and tapping on a category name will show a map indicating the area covered by the warning. On the map page, a toolbar button gives access to the full text of the weather warning. Collectively, the app's top level pages provide "at-a-glance" access to the key weather data for everyday usage. It's an approach and implementation that is similar to a number of other weather apps. 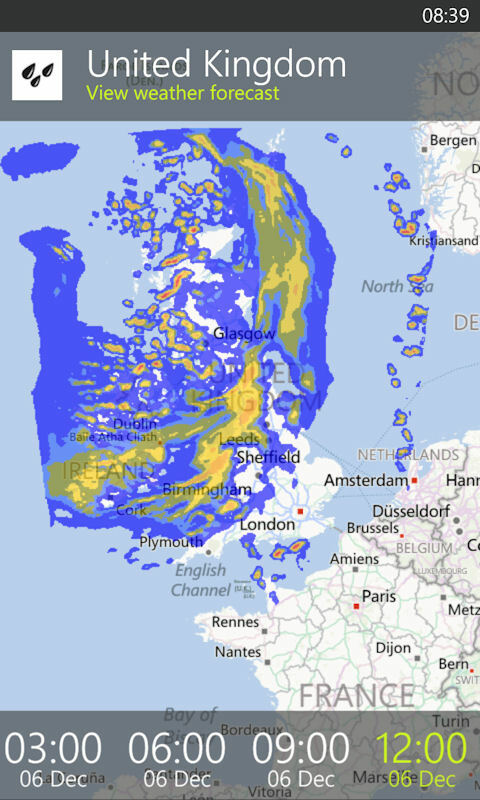 However, as we shall see, these top level pages are only a small portion of Met Office's overall offering. Tapping on any location (summary or locations page) brings up a secondary pivot page for that location, with forecast and warnings pages. The first of these provides a five day forecast for the location, and the second provides a location-specific version of the weather warnings functionality described above. Tapping on any day on the forecast page opens up another pivot, with weather predictions provided for three hourly intervals throughout the day. This level of detail should keep even the more paranoid weather watcher happy, but, by gradually disclosing the information over different levels, the app prevents the casual user from being overwhelmed by information. It's a well thought out presentational technique that works very well with the Windows Design Language. 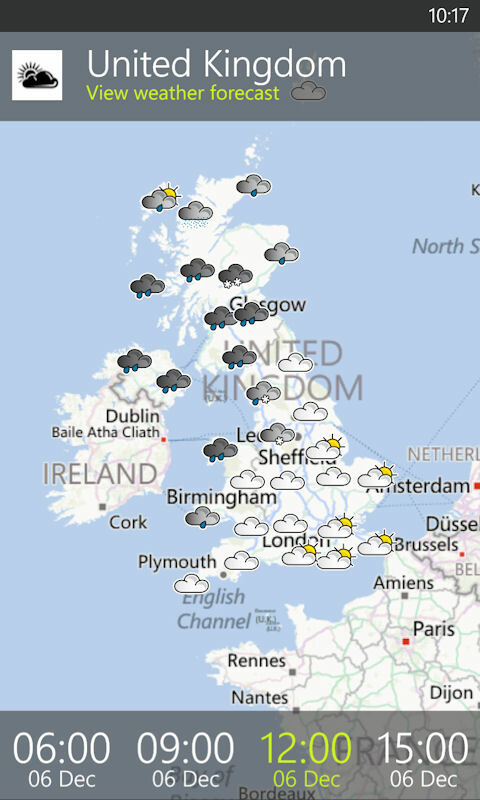 Tapping on "Weather map" on the top level locations page brings up a map that shows the rain radar map for the whole of the UK. The map can be advanced forwards and backwards, in three hourly intervals, using the control-bar at the bottom of the screen, thus allowing you to see developing weather patterns. In addition to the default rain overlay, a number of others (weather, temperature, wind, UV, satellite and pressure) are also available. These will no doubt be welcomed by amateur meteorologists, but they are also the most convenient way to provide an overview of weather information for an area, rather than a specific place. The maps are zoom-able (pinch/splay gesture), and, as you zoom in, additional detail is loaded. For example, rather than displaying regional temperatures, the app will display temperatures from individual weather station locations. 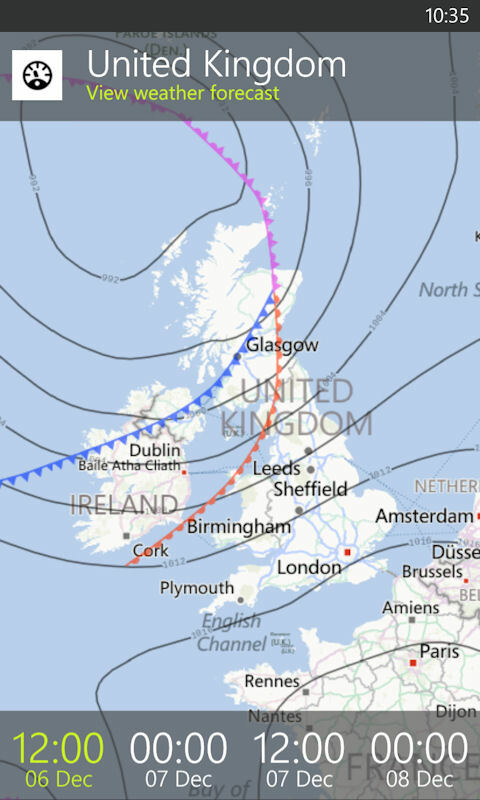 Tapping on the banner at the top of any weather map will show a full text, five day, forecast, with the location dependent on what you're viewing on the map (zoomed out, shows a generic UK forecast, zoom in and you'll be shown a regional forecast). It is this kind of extra detail that really makes the quality of the information in the Met Office app stand out from its rivals. 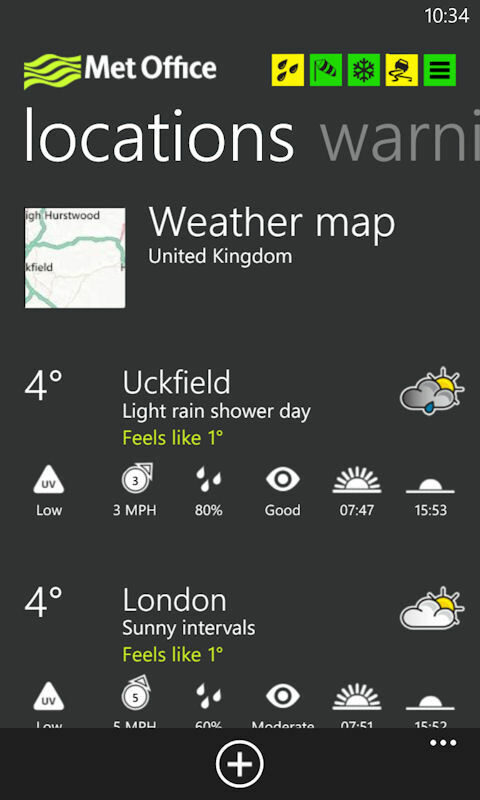 Live Tiles are an important area of any Windows Phone app, but that's particularly true for weather apps. The Met Office's Live Tile functionality doesn't quite match the quality of the rest of the app, but it's not bad by any means, and provides fast access to more in depth information. Compared to some other weather apps (e.g. Weather Flow), the amount of information displayed is relatively limited, and it's a shame not to see a double sided (flipping) Live Tile. Pinning the app to the start screen from the app list results in a location-aware Live Tile that will show the forecast for your current location (nearest weather station), but only when the Live Tile is configured for double wide size, which isn't really justified, given the amount of information being displayed. Pinning a location from within the app results in a more useful standard size Live Tile. These location-specific Live Tiles also support the small size, but, somewhat strangely, not the double wide size. 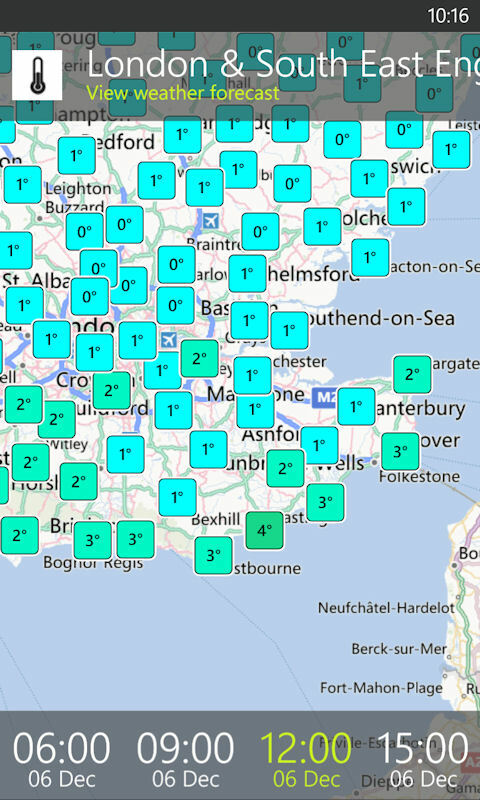 The standout feature of the Met Office app is the quality of the data on offer. 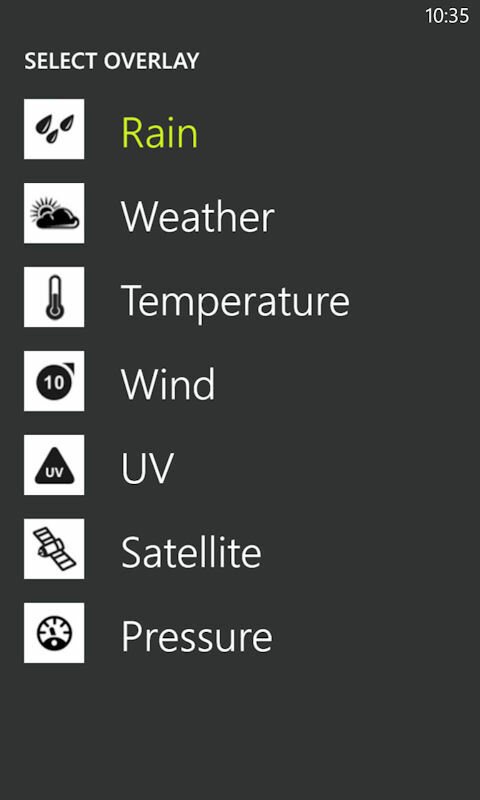 Yes, some of this data is licensed to third party apps and services, but it's hard to think of another weather app, for Windows Phone, that provides this amount of detail for those in the UK. Just as importantly, despite the level of detail on offer, weather information is presented in a digestible way, and in a style that will be familiar to those who have used or seen forecasts based on Met Office data (i.e. most of the UK population). There's definitely room for improvement, most notably around integration with the platform's UI outside of the app itself. For example, the Live Tile functionality could be improved, and lock screen integration would be a logical addition. Furthermore, some of the routes through the app, such as those required to get to the text versions of weather warnings and weather forecasts, are not as intuitive as they should be. 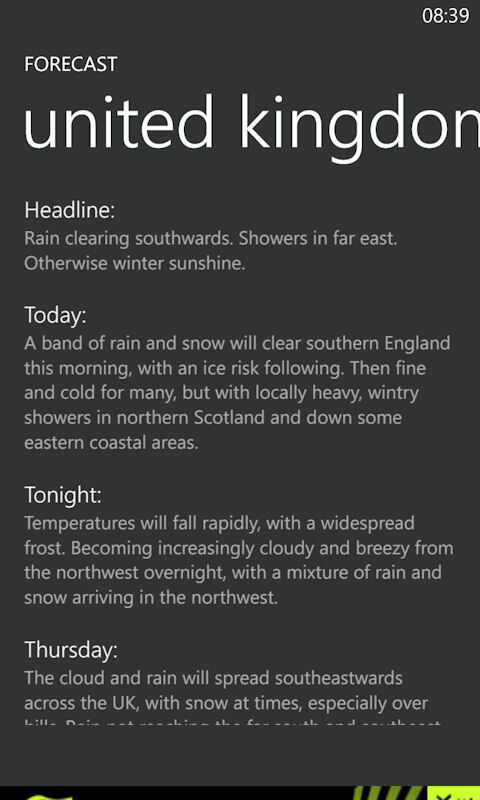 These are relatively minor criticisms though and, looking at the overall app, there's no doubt that this is one of the better weather apps available for Windows Phone. It's fair to say that weather apps, more than most, are subject to personal preference. Some people want as much information as possible (well served here), some want a glance-able screen (reasonably well served here), and others want very specific information (likely to be well served here). Given that the Met Office app is a free download, we would strongly recommend that anyone living in the UK download it, and see if it meets their particular requirements. There's a good chance that you'll make your friends living outside the UK rather jealous! 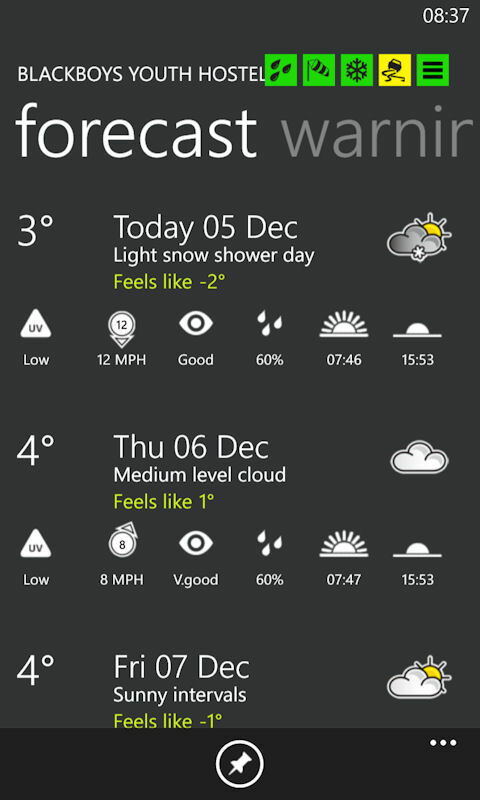 The Met Office app can be downloaded from the Windows Phone Store for free. It is only available for Windows Phone 8.